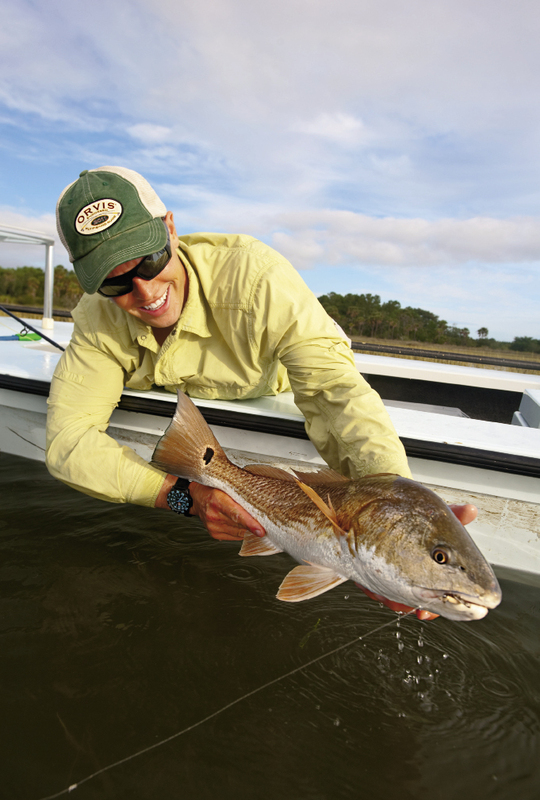 While regulations allow anglers up to three redfish (15 to 23 inches long) per day, most sportsmen practice catch and release, handling the fish with care and fully reviving them before releasing back in the water. Each fish is too valuable to our culture and economy to be caught only once. 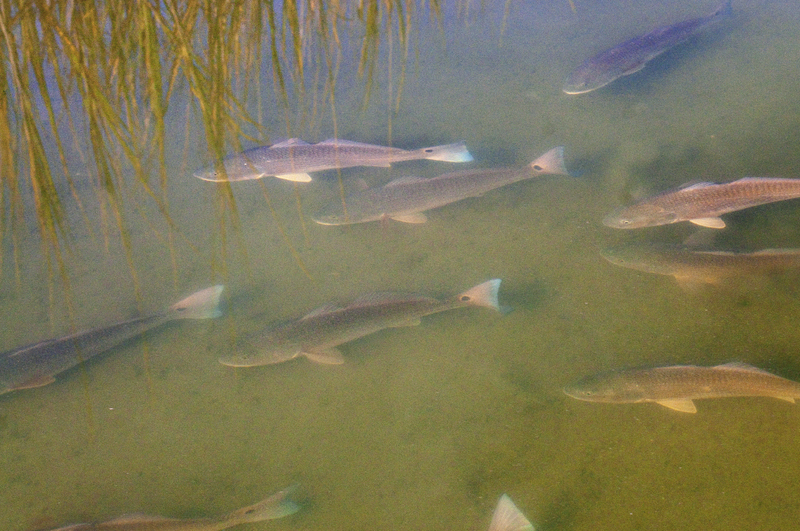 The clearing water of late fall and winter makes it easier to spot gathering schools of redfish at various tides. 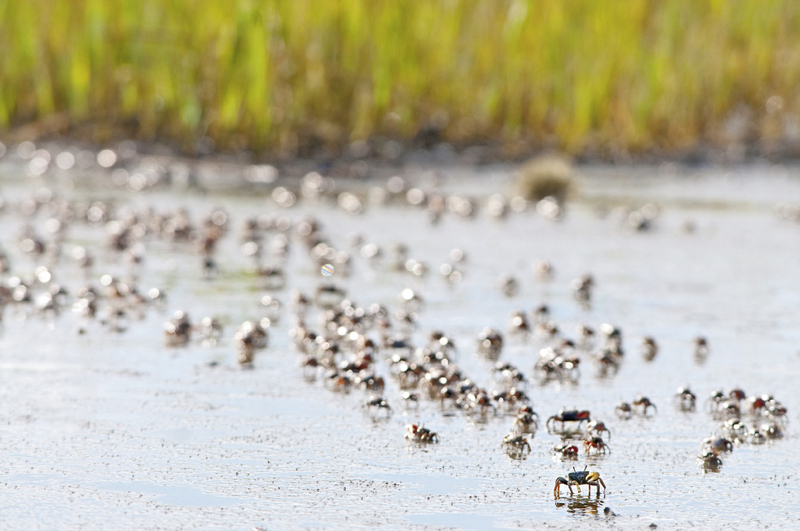 Fiddler crabs, a favorite snack of redfish, scurry across the mud at low tide. 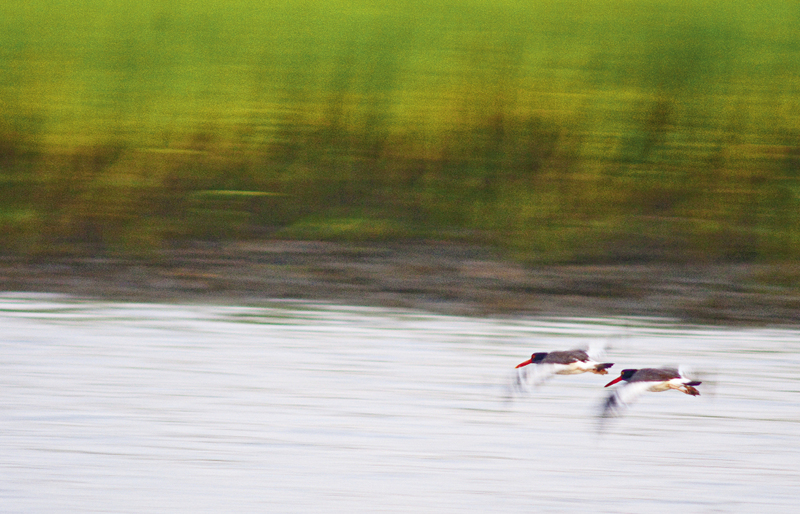 American oystercatchers and many other crustacean-eating wading birds can be seen on the same flats and oyster basins where redfish live. 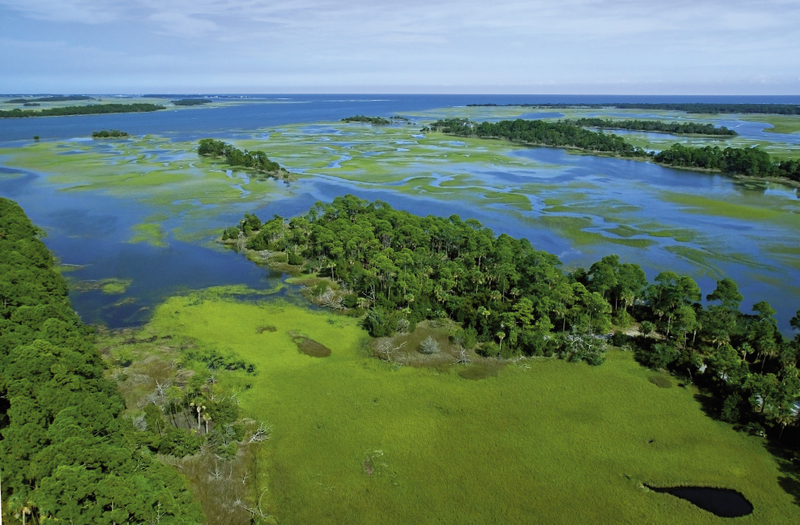 Tailing flats—hard bottomed grass flats that flood when high tides exceed six feet—can be seen easily from the air. Google Earth works well enough when a helicopter isn’t available. Captain Jeremy Mehlhaff admires a good-size redfish caught during an October tailing tide. After surviving 30 long, cold winters in the Northeast and Colorado, I made the decision to renounce winters entirely and move South, arriving on the sunny Charleston coast in the spring of 2001. As a diehard fly-fisherman, I did not make the decision lightly. Leaving the mountains and trout-filled rivers behind meant giving up my status as a guide and, unbeknownst to me, getting knocked back to a rank amateur. I had studied up on the Lowcountry’s storied redfish in books and magazines, but finding them myself in the vast marshes here—let alone catching one on a fly—proved far more difficult than my honed trout-stream skills could handle. I was told that when you see a redfish tail for the first time, it is unmistakable. Unfortunately, my first sighting was elusive, and I spent many days casting at diamondback terrapins and swirling mullets in the hot summer sun. 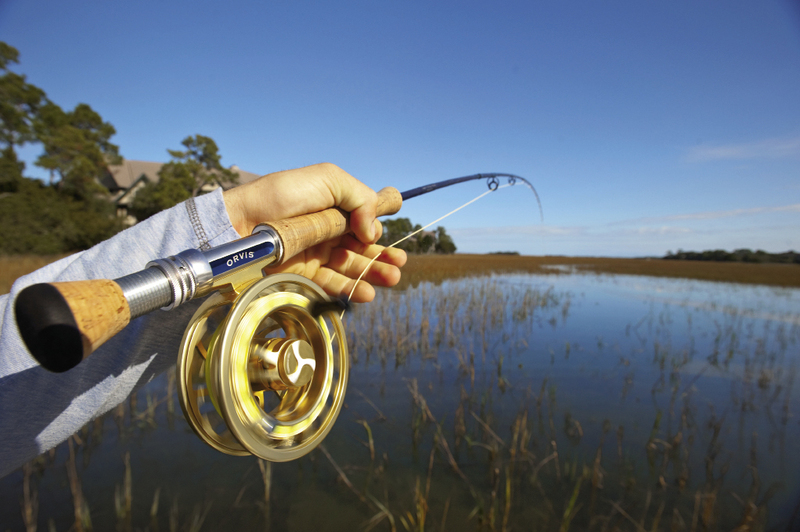 Though I loved Charleston, I was beginning to wonder if I’d ever bend a fly rod again. At first I sank to my knees in the thick ooze, which put the water at my waist. Then I slogged a few more steps, ending up waist-deep in mud, water up to my armpits, and the tide still rising. It’s moments like this that make you contemplate the decisions you’ve made in your life, but I didn’t dwell on them for too long. After a bit of wiggling, I managed to get one knee out, then the other, and was able to army crawl several feet until the grass became shorter and the bottom solid. Mud-covered, soaked, and nearly defeated, I slowly moved on, one careful step at a time, searching for tails and a chance to cash in the dues I had just paid. There were fiddler crabs scurrying around my feet and mullet jumping all around. Surely, this feels right, I thought. 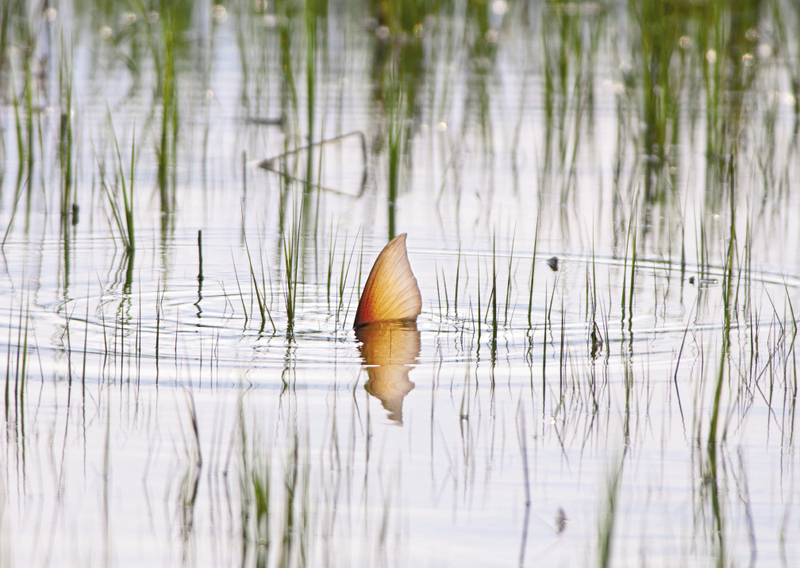 Then, there it was—first just a little wake pushing across the surface, next a subtle dimple in the reflected sky, and finally into the air the copper tail rose and briefly waved, showing a glimpse of its telltale spot before plunging back into the marsh. I somehow remained focused, tossing my fly into the air. With two quick false casts, I laid it down a few feet to the left of the dissipating ripple where the tail had just submerged. I stripped the fly twice, moving it only a few inches each time, paused, and as I began a third strip, the water exploded, and the line tightened. A few glorious minutes later, I landed the redfish and was able to admire the spotted tail closely for a few moments before releasing him back into the marsh. No longer skunked and relishing my first redfish, I didn’t even care that I would have to traverse the treacherous pluff mud to get home. 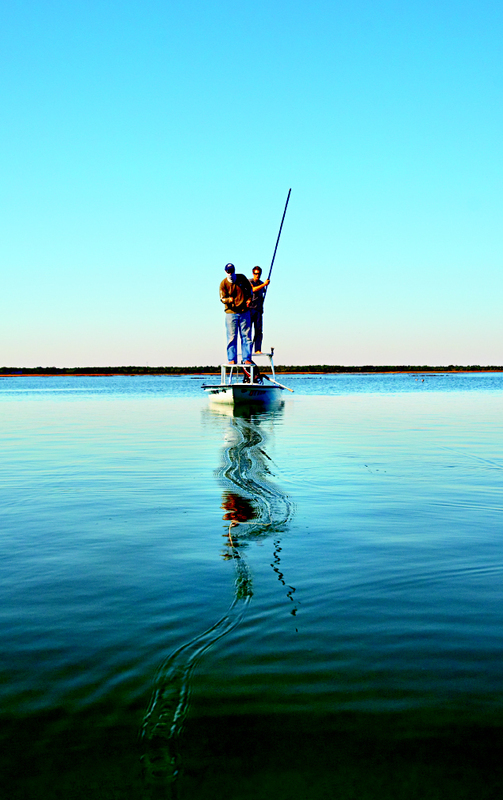 We are blessed with an abundance of water—six feet of life-giving saline pumping in and out of our estuarine world—and redfish thrive here. 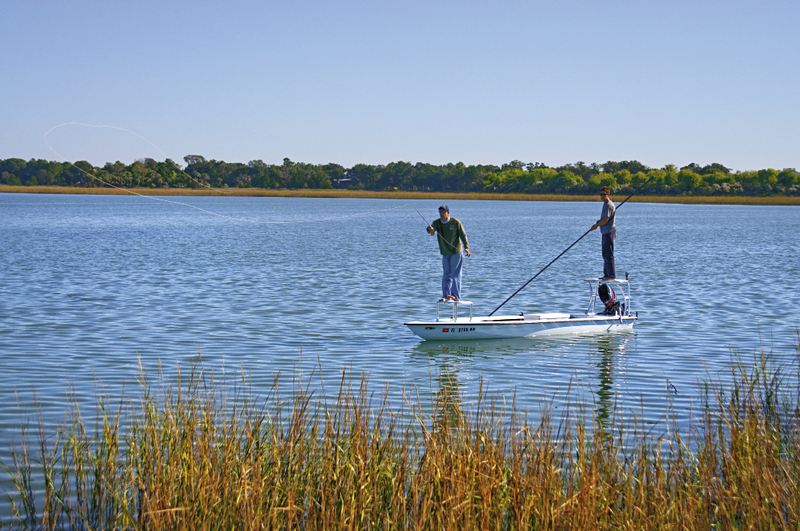 Adults of up to 50 or 60 pounds can be found offshore, in deep channels in the harbor or off the beaches, but these are of little use to fly-fishermen. We want the “skinny-water” redfish, ones in their formative years that belly crawl across the pluff mud in a few inches of water or tail on flooded grass flats. They top out at around 30 inches and 12 to 15 pounds, but the sight of a dozen or so pushing down the edge of a mud flat with their backs and tails exposed, sending shrimp flying into the beaks of squawking gulls, will make even the most experienced anglers a little weak in the knees. I fish year-round, but of all the seasons, fall is my favorite time to cast for redfish here. The oppressive heat and humidity gradually subside, and the water slowly clears. 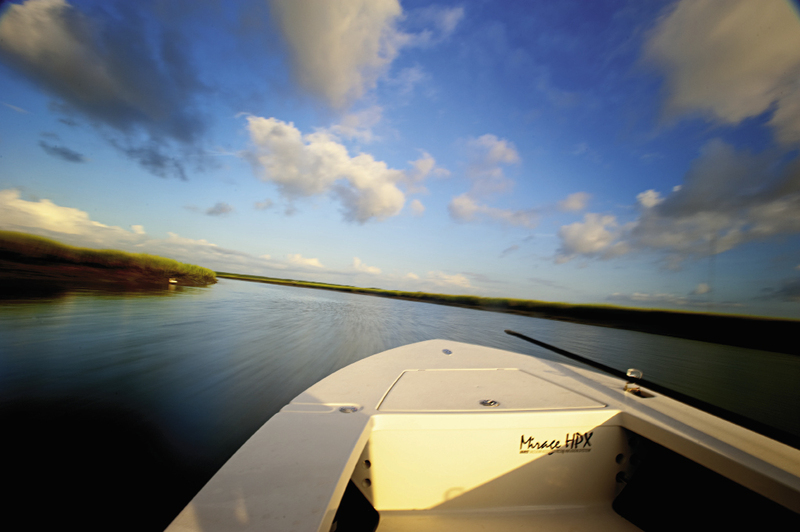 The high tides of summer are still in full swing, and the cocktail-size shrimp have made the redfish gluttonous. Look for tailing tides—high tides around the full and new moons, typically in the early morning and late evening—which rise over the magic six-foot mark. Flooding the hard-bottomed flats where fiddler crabs seldom see finned predators, these tides allow redfish to push through the golden grass. When they are rooting around the bottom sucking fiddler crabs from their burrows, their spotted tails rise out of the water, giving away their location. “Tailing” fish are often distracted while they are feeding and can be quietly approached by foot or flats skiff. 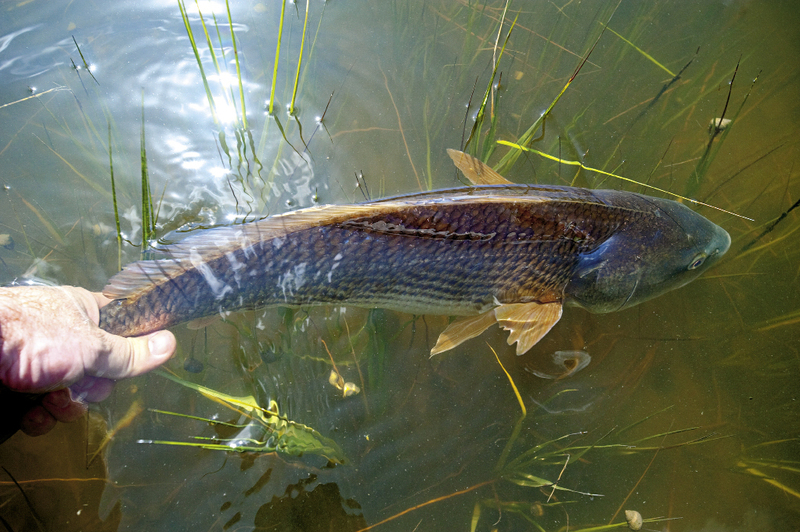 A fish in a full headstand has a face full of mud and a meal on the brain, so fishermen should use this opportunity to get a cast in close, twitching the fly slightly to create movement without pulling it from the fish’s limited field of vision. Early morning low tides will find redfish ganging up on shrimp with gulls and wading birds, collaborating to block an aerial escape. At sunrise, look for gulls hovering over nervous water in shallow bays and approach stealthily. As these schools are usually on the move pushing shrimp up or down a bank, it’s best to position yourself so that they will come to you and then get your fly out in front of them. When the fish sees it, you want to read their reaction, stripping the fly to match their speed. Redfish are used to their prey swimming away from them, so make sure your fly is doing the same—a fly that swims towards a redfish’s face will usually make the whole school explode in a boiling mass of copper scales and mud before they head for the horizon. As fall slides into our gentle winter, redfish will abandon the tailing flats to gather into ever-growing schools, offering excellent opportunities for sight fishing. But even on the best winter days, I find myself longing not for the trout streams of my cold mountain past but for the tails of the Lowcountry fall. For a boatload of additional Lowcountry fly-fishing info, including regulations, licenses, guides, and more, visit www.dnr.sc.gov/fishing.html.